Tonight’s local music radio show on WBKM.ORG will run from 9-11pm US Eastern time Thursday May 10. It can be streamed from the website or here: WBKM It will go as follows. From our small city to the great big world, these are the Sounds Of Burlington. Let’s begin tonight with a trip over to Robot Dog Studio for an interview and performance by The Brand New Luddites. 1.) Complacent – The Brand New Luddites. 2.) Poison Electricity – The Brand New Luddites. 3.) Only Human – The Brand New Luddites. 4.) Plastique Dinner – The Brand New Luddites. 5.) Transmission Hope – The Brand New Luddites. I really want to thank Ryan Cohen for making us sound so great and smooth. OK, Let’s dive in and play a ton of sweet songs. I think that is my favorite Mountain song, but I say that about so many of their new songs. Great song from Francis who put on a ferocious show at Waking Windows. I love the Vetica song and Rabbit rocked WW hard too. OK, here is the next song on the album I’m playing all the way through, song after song, week after week. It’s the title song. I missed Clever at WW, but fortunately, so did the lightning. Great song form Hana. It was cool to run into Eoin and Dave at WW. Great song from Kelly. This next song always fills me with hope. It was great to see Druids at WW. I love that Swale song. Same goes for the Hero song. Sean from Telephone and Druids may have a show coming up in the near future with Matt Hutton so we may get to hear some Telephone songs live soon. I love this next song. I think Ruckzuck are coming back in a couple of months. I can’t wait to see them again. Lovely is such a beautiful song. Great songs from Peter and Carol. All of those are from Robot Dog sessions and the first three feature the studio piano. OK, we’re running late but I’m going to play one more set. This song just fills me. Those songs are all so great. Well, I hope you enjoyed checking out the music of our town. Let’s do it again next week, shall we? Tonight’s local music radio show on WBKM.ORG will run from 9-11pm US Eastern time Thursday March 8. It can be streamed from the website or this link WBKM It will go as follows. From our small city to the great big world, these are the Sounds Of Burlington. I’ve been listening to the new Phil Yates album a lot and love it. Let’s start tonight with the last song on the album. I went out to see the Gators last night at Nectar’s. They played a great version of that song and lots of other dark tunes. Another great song from the Siberians album Black, Blue & White album, which I’m playing all the way through, song after song, week after week. Milton played a great version of Pearl at Light Club Lamp Shop on Monday. Great new song from Phil about patriotism. These next two artists will be at ArtsRiot next Wednesday for a live recording for Big Heavy World. Another great song from Phil’s upcoming album Party Music. I just had to play it into the Crazy song. It should be a great show next Wednesday. This next band will be at Radio Bean tomorrow. Swale will be at Zenbarn on Friday. No and Turtle will be there on Saturday. This next band will be at the Lamp Shop tomorrow. I hope you enjoyed the fun theme in the last set. Three of those songs are very old. So is this one. If you ever get to see the Primates play, go! Great songs from gneiss and Snaz. I love that Strung Out song. I’m so I happy I have an album by this next band. Great songs from Gregory and Robin. I stacked them together because they mix so nicely. Anne-Marie has such a lovely voice and Uncle are a pretty great band. Great song from Maiz. OK, let’s play another classic. Great songs from Elephants and Conspiracy. Well, I hope you enjoyed checking out the music of our town. Let’s do it again next week, shall we? From our small city to the great big world, these are the Sounds Of Burlington. It was a rainy week but the last couple of days have been beautiful and sunny and this town is filled to the brim with jazz. Tonight’s show will be a jazz free zone. Let’s begin with a new wispy piece of music from one of the classic bands in town. That is the next song from Lights, Camera, Action and is the first song on the Camera EP. Great song. Zero Likes feature Doug McAllister from Ninja Custodian and Doug just sent me that a couple of days ago. Thanks!! Great song by Phil Yates and the band. Phil is moving on to Chicago soon and will play one more show tomorrow at The Monkey House. I will be thee. Hmmm, Swale. OK, last night I went over to Robot Dog Studio and recorded an interview with live songs from Dino Bravo. I want to thank Ryan Cohen for doing the sound, Jeff Arbor for helping to set up and Tom Wolf for doing video. Here we go. Thanks for rocking us nice and hard Dino! They mentioned they have an upcoming show with The Dirty Blondes so let’s play one of their songs. I’m happy for Phil but sad that he won’t be playing around all the time anymore. I’ve enjoyed many shows over the years and have played his music on my radio show since the second one I did in March of 2013. Black Rabbit will play the show with them tomorrow over at the Monkey House. I think Swillbillie will play the upcoming Nectar’s show with Dino and the Blondes. OK, this next band are in town tomorrow night for a show at Jim’s basement. Another classic from Phil and the band. Great cover of the Stones song by Bridget. Broccoli played back in the late ’80’s in Burlington and were lots of fun. Grand are so much fun. I really like a lot of Phil’s songs but he and the band have played many shows with some really fun bands and I got to know them because of Phil. Here are a couple. Another great Phil song. Phil and the band played with Yurt at the Monkey House in July of 2016. They played with The Parts at Manhattan Pizza and Pub in January of this year. They played with Color Exchange at Nectar’s in 2015. This next band also played that show. That one features Raph Worrick on the keys. Great rocking song from Kat and the band. Their guitar player, Bob Wagner, is joining Seth Yacovone Band tonight at Nectar’s for a band they are calling Water For Gasoline. That’s a brand new song from Casey Merlin Rae, who is living in Washington DC but comes back to play now and then. Great song from Homes. OK, there is not much time left so let’s play a few more songs as we say goodbye to the mighty and wonderful Phil Yates. Thanks again Phil!! I hope you enjoyed checking out the music of our town. Let’s do it again next week, shall we? From our small city to the great big world, these are the Sounds Of Burlington. Today is my birthday so I’m going to celebrate by playing some of my favorite songs. I hope you like them too. If your band is not on tonight’s play list, it’s not that I don’t love you, it’s just I had two hours to pick music and I love far more than two hours worth. Every song on tonight’s list is one that I love. Aaron is such a great guitar player and such a great guy and has a great voice and I love that song. The Bern song has really gotten to me. I love how easy to sing it is. Hana is just stunning and that is such a touching song. Peg has been one of my favorites for a long time and that is such a beautiful song, on so many levels. OK, it’s time for the next song on Callisto. I remember thinking that was the greatest song I had ever heard by Mountain when I first heard it. Now I feel that way about their newer songs that will be on their next album, but since it’s not recorded yet I had to play Beast. Vedora used to play Sober a lot when they played shows after the first album came out. I’m glad they got that one onto the second album. I love the huge sound. Brothers always just fills my heart with love. I want to send that one out to my brother Ken. That’s such a cool song from Alpenglow. It’s been fun hearing them evolve. So, on Tuesday night I went over to The Monkey House and saw four great bands. I loved the sets from Tyler Daniel Bean and Better Things. The Path opened the night with a killer punk set. The other band who played are one that I have come to just love. They come around once or twice a year and always play a blistering show. I love every song on their new album and want to showcase them a bit right now. Thanks for everything Slingshot Dakota!! I love the new album and that song especially. When I first saw them I got a CD single with Day and 78 run together and still love those songs. It’s like the idea of love flowing into the practice of love. Paycheck is such a great song. I was so psyched when they opened with it. OK, let’s play a great rock and roll song. I love so many of Swale;s songs. Picking one was hard, but Next always gets me going. Color came to town and played Nectar’s one night a year or so ago. I’ve loved Sparks ever since. Ryan Miller from Guster keeps turning up at cool local events. Satellite is such a great song. I love how it sounds back to back with Sparks. Earthquakes always rocks me. I’m beginning to really like a lot of songs on Binger’s new album, but this one from their last EP always lights me up. I was lucky enough to see The Cush many times when they lived in Vermont. That is from their most recent album and it’s great to know they are still making great music and I can’t wait until the next time they are able to come back and enchant us. I’ve always loved Zola and wanted to play Vest because it rocks so hard. I love The High Breaks and their rearranged Sabbath songs are just wonderful. Hmmm Binger. Keep writing those great words and playing that great music. This is a great song from one of the most elegantly powerful bands to come out of Burlington. We are on the cusp of summer and that one always reminds me of beautiful summer nights. I’m 51 today and was born in 1965. Hero are a band I caught a couple times in their short incarnation and love the sweep of their songs. I love a lot of Telephone songs but that one was just calling to me. On Monday, the Dirty Blondes are playing at Nectar’s. I love them because they rock so hard. I love that Elephant’s song. Ornan plays drums for both bands. I hope you enjoyed checking out the music of our town. Let’s do it again next week. Bye. See Ya. Sayonara. 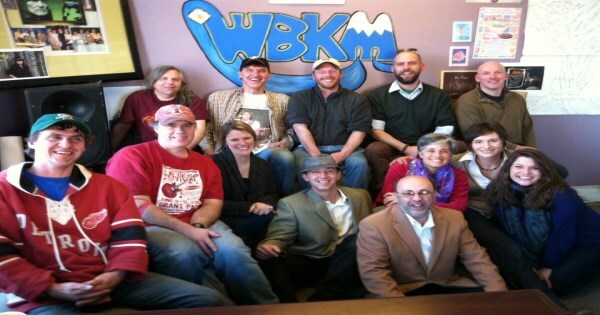 As always, I want to thank everyone who made tonight’s show on WBKM possible. Thanks to: Kate Bush, Peg Tassey MUSIC, Hana Zara, Aaron Flinn, Alpenglow, Joe Adler, Johnnie Day Durand, Vedora, Caroline Marie, The Mountain Says No, Andrew Frappier, Justus Gaston, Jedd Kettler, Ben Maddox, Slingshot Dakota, Carly Comando, Tom Patterson, Carly Comando, Phil Yates & The Affiliates, Phil Yates, Raph Worrick, Jacob Blodgett, The Color Exchange, Justin Ellis, SWALE, Tyler Bolles, Jeremy Frederick, Eric Olsen, Amanda Gustafson, Binger, Dalton Muzzy, Braden Winslow, Shakir Stephen, The High Breaks, Matthew Bryan Hagen, Todd Gevry, Kevin Lynam, Julia Austin, Alice Austin, The Cush, Burette Douglas, Gabrielle Douglas, The Red Telephone, Matt Hutton, The New Siberians, Brendan Devitt, Ted Pappadopoulos, Sarah Blacker, Dirty Blondes, Chris Clark, Rebecca Rogers, Diane Sullivan, Ornan McLean, Elephants of Scotland, Adam Rabin, John M Whyte, Dan MacDonald, Black Rabbit, Jane Boxall Percussion, Marc Scarano, Darlene Scarano, Fish, MARILLION – THE FISH YEARS, Marillion, The Church Band, Tony Gallucci, and everyone else!!!! From our small city to the great big world, these are the Sounds of Burlington. It cooled off a little this week and we had a nice thunder and lightning storm, but today was a beautiful sunny day. There are lots of people about and a joyous spirit in the air. I drove to New Hampshire and back yesterday and the mountains of Vermont are lush with tons of shades of green. Enjoy this moment and enjoy your loved ones whenever you can. It was my birthday this week and I’m going to pull out a few of the bands and songs I’m most passionate about. If your band is not on this list it’s more that I only have two hours, not that I meant to miss you. This song has been rocking my world lately. This is Little French Earthquakes by Phil Yates and the Affiliates on WBKM, and this is Burlington’s Kind of Music. I knew I had to play a Rabbit song and that was the first one that really caught me, and still does. Love that classic from ZT. It must have been a beautiful time, it must have been a terrible time, it must have been a beautiful terrible time indeed. That one has been speaking to me lately. Let’s continue through Swale’s album The Next Instead. I love the way Hana’s lyrics walk you through a picture. Great song from John Baumann and Robert Gagnon. That’s another song from Sarah’s new album In Waves. It’s not quite out but can be pre-ordered. This next artist is in California, but put a ton of music into this town over several years. They put on some very intense rock shows in the 2000’s. Classic from Ninja. Dino just played a show in Stowe where they were billed as Dino Barvo, possibly and puppet show. This next band have a new album and a new video for this song. I love the nod to Woody Guthrie and the idea of killing fascist ideas with words and music and ideas and inspiration instead of with bullets. Killer song from Beano Parker’s non Wards band. There’s everything to love about the Cave Bees. Speaking of ideas that could kill fascists and Woody. That was recorded live at Radio Bean. It doesn’t get more Burlington than that. Killer song from Peg. Brothers and Sisters is dedicated to my brother Ken and all of the musicians that I feel are my brothers and sisters. You know who you are. Thanks for the beautiful song Joe! Bernie is the kind of guy who has spent his whole life trying to kill fascists with wonderful ideas. OK, on Tuesday I turned 50. That means I was born in…. Love that song from DF. Revolution Doll style now! I just love that Elephants song so much! I finally got the Mountain songs into a playable format. I love the build in that song. Yea, Siberians. This is a great song from a friend of the show. I just love that song. I’ve loved the Maryse Smith song since I first heard it. I hope you enjoyed checking out the music of our town. Let’s do it again next week, shall we? I just got back from my local music radio show on internet only Wbkm Dot Org. There was a lot of new music, which is always fun. From our small city to the great big world, these are the Sounds of Burlington. It’s dark now, but the days are getting longer and it was fully twilight when I walked down tonight. Thanks for putting up with all of the Lendway songs last week. I’m not doing that tonight but did want to say I will miss Michael Clifford‘s other band too. Michael, stay safe in California. Enjoy the ocean, but take care to not become a shark victim. This is their theme song on WBKM, and this is Burlington’s Kind of Music. Great song from the new Affiliates album No Need To Beg. They played a fun show at New City Galerie last week to release the album. Killer song from Mountain. I cant’ wait to hear the full album. Great song from Lendway and I will miss SV a lot too. Let’s continue to move through Swale’s album The Next Instead. They played this on WCAX recently. Great song from Kat and the band. Killer new song from Hana’s album The North. That one really goes into some deep spaces. Great song from the just released Maryse Smith album The Way It Is. This next band opened for Phil, but they played as an acoustic duo, instead of the usual heavy rockers that they are. They did a sweet version of this song. Mullins play a couple of songs with Francis, and the Barbacoa set with Lowell Thompson was pretty killer too. At the same time that was happening Vedora were playing at Radio Bean so I missed them, but do have a new song from them. I was so psyched when I heard Landlady were coming to The Monkey House on April 24th (tomorrow) but then realized I would be out of town. Rats. If you are in town, go check them out. Thank me later. Great new song from Particles. If you like that, go to their website where you can pre-order their new EP. That’s the title song from Sarah’s new album that is coming soon. Can’t wait for the full Vedora album. So, tomorrow I’m heading to Montreal for three days of Marillion shows. They have a couple of side shows at a brew pub called Brutopia. On Saturday, Elephants of Scotland are playing so it will be great to see them play in Montreal. They played at Club Toast once as a three-piece many years ago. So, I totally slacked and missed some chances to see music this week. I’m going to have to catch up with this band soon. Classics from Pinhead and Chin Ho! I love that song from Wave which was recorded live at Nectar’s. OK, time for a few more. Here’s another great one from Maryse. Another cool song from their new album. Great song from Farm. I hope Split Tongue Crow have a new album soon, the first one has so many beautiful songs. I hope you enjoyed checking out the music of our town. Let’s do it again next week, shall we?